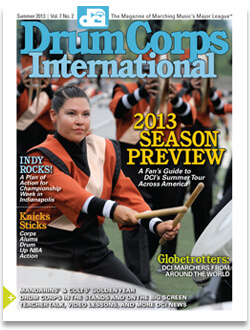 DCI's traditional combination of artistry and athleticism meets new faces and places, giving 2013 the potential to be the hottest — and most entertaining — season on record. Whether they're touring with groups from their respective homelands or filling the ranks of U.S.-based corps, DCI's international members display talent, commitment, and culture both on and off the field. With pulsating action at Lucas Oil Stadium and great off-the-field events all around town, Indy will once again be the place for all drum corps fans in August. Online lessons in the off-season have helped the Colts get ready for 2013. How annual class trips to DCI's Southeastern Championship transformed an Atlanta middle school's band program. DrumLine Battle events ... Kick Start your fall band season this summer ... Drum corps at the cinema ... Corps alums drum up NBA excitement ... More classic performances come to Blu-ray ... and more!